Nice try, James, but your re-written history doesn’t stand up to scrutiny. These are the facts. Jack Straw’s 2008 cross-party White Paper never became a Bill because the Labour Cabinet (incl. Miliband) bottled out. The Cameron/Clegg Coalition built on Straw’s proposals, published a draft Bill in 2011, it was improved by a Joint Committee of MPs/Peers and passed its 2nd Reading in the Commons with a huge 338 majority (193 v 89 Tories, 202 v 26 Labour & all 53 Lib Dems in favour). Only then did Miliband and the Shadow Cabinet not only fail to support the Programme Motion but refuse to suggest an alternative timetable. Clearly, they put party games ahead of principle. Result: the agreed Bill could have been an Act by now, and we would have been well on the way to the first elected Senators. Fortunately we have the years 1997-2010 for comparison, during which time Labour had no need/ability to pass the blame on to anyone else. 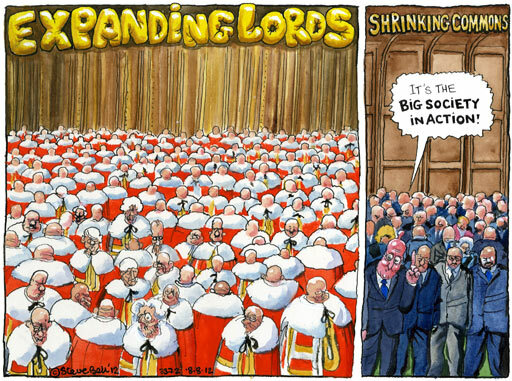 And what did they do about Lords reform then? Paul, if you’d actually bothered to read what I said, I didn’t deny that they put party before principle. What I said was that the Lib Dems did too – sacrificing Lords reform to provide a pretext for going back on their commitment to support the boundary changes. If they’d been truly committed to Lords reform, they wouldn’t have acted the way that they did. Labour may well have put party before principle, but so did the Lib Dems. So a little less of the moral indignation please. Sid, well they achieved more in terms of Lords reform in 1997-2001 than anyone else had done since 1958 or anyone else has done since. Do you really consider booting the vast majority of hereditary peers out of the Lords as insignificant?